Little known fact: it also flies when you're not having a lot of fun as well. This has been another busy week - we're going home to Ireland at the end of the week to visit the Irish Gingerbreads. My mother has a vigorous schedule of activities planned, including a trip to the west of Ireland. My poor husband has been in the clutches bosom of the Gingerbread family for nearly a decade and hasn't left the eastern province of Leinster yet. There's always too much happening at my parents' house to go a-touristing. This time, however, we are going to hop into a car with my parents and whizz off to the Atlantic coast to show him the Ireland he has thus far only seen on postcards. He's very excited. In the meantime, I thought I'd post a picture of my latest finished object, blowing merrily in the breeze on the roof patio. 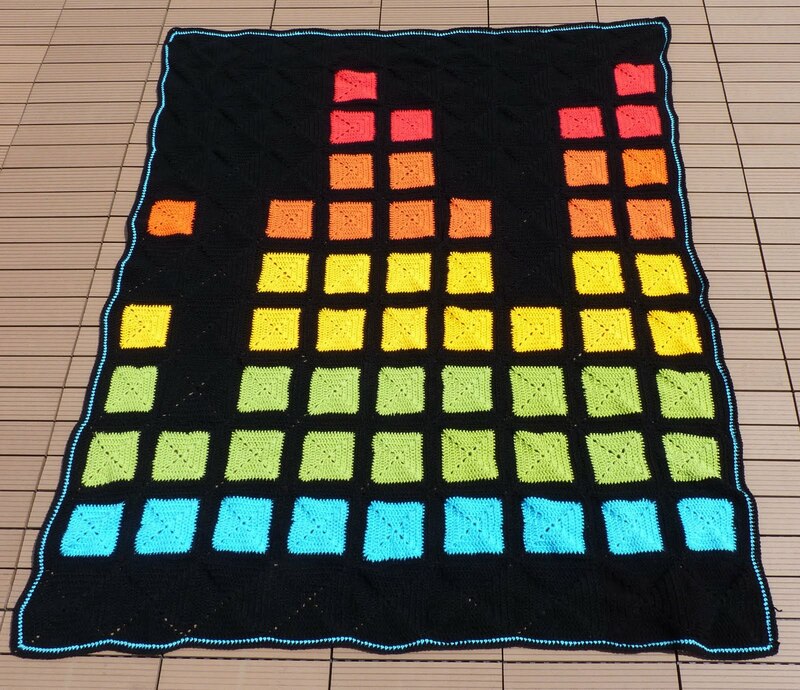 There are 81 squares in this blanket. Eighty-one. Eight-oh. And this follows hot on the heels of the 99-square Equalizer I finished a week ago, swearing loudly that I was never going to make a flipping motif afghan ever again. Clearly, Pavlov's dog had the ability to learn more quickly than I did - perhaps the next time I decide to make a sew-together-extravaganza, someone should ring a bell and the rivers of slobber on my fingers might remind me of those ends, that sewing. Oops, too late. Have already started the next one. Why, hello there. Nice of you to stop by! Life in the Gingerbread Household is ticking over: we've evicted the pigeons, Mr Gingerbread emptied the dregs of the compost bin into our flowerbed and now the house stinks of manure (strange that, because the bin was full of vegetable waste and coffee grinds, yet the entire house now smells like a slurry pit), and I've been crocheting away between exams and conferences. 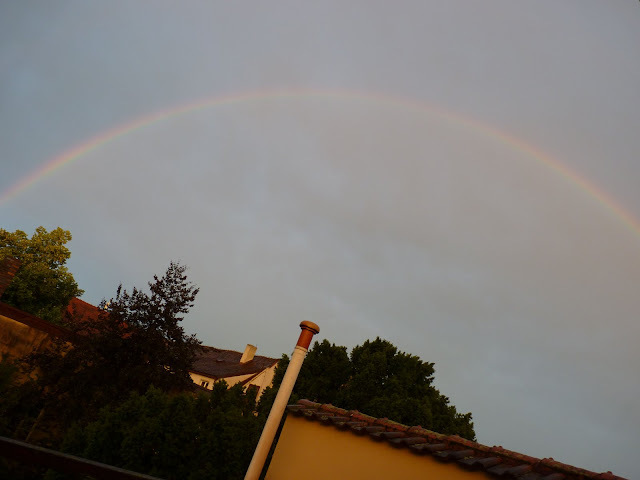 My husband studied science: biology and chemistry, to be more precise. I studied languages - German and Italian, if you really must know. If you're curious about which sin will land you on the fourth terrace of Dante's Purgatory, I'm your woman (and it's sloth, by the way - one of my favourites.) If you're looking for information about the general workings of the world, you'd be well-advised to choose my husband as your Phone A Friend if you ever end up on Who Wants to Be a Millionaire? "Why is the cheese mouldy already? Why?" I should know by now that these are purely rhetorical questions: my husband tends to verbalise many of the thoughts I would keep quiet. He prefers to put them in the form of accusing questions. This is something he's inherited from his mother - dinner at their house can be very stressful for someone like me, who feels compelled to answer any question put to her, regardless of whether they are real questions or just general wonderings. Sadly, as I say, my scientific knowledge is nowhere near good enough to satisfy my husband's craving for answers. Last week we made a curry (actually, I made a curry - I was just being diplomatic) and split it between two pots for convenience (because we were dining on the upstairs patio and I didn't want to schlep our cast-iron wok up the stairs. There's name-dropping and then there's outdoor-dining-dropping. This was the latter.) The following day, the curry in the saucepan had gone off, but the curry in the wok was still edible. After a brief struggle in which I wrestled the saucepan out of my husband's hands while he whined that it was still okay to eat (he views rancidity as a personal challenge: "I bet you I could still eat that! "), he turned his big blue peepers on me and demanded to know why it had gone off. "Why has it gone off?" he said. "Why?" "Maybe because the metal in the wok is thicker and it kept the curry cooler," I suggested. "My darling," he said, "Bear in mind that I love you. 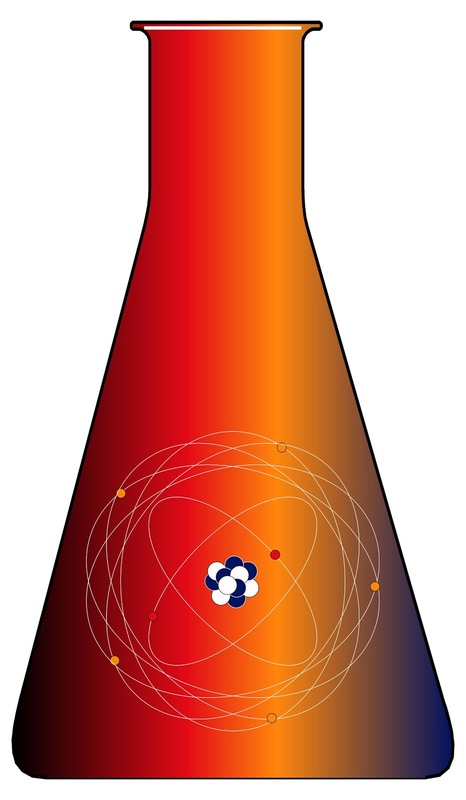 But sometimes your scientific theories sound like they've come from a children's book." Readers, I was stunned. Then I laughed till I almost threw up. Sadly, he's right - my scientific theories sound like they've come from a children's book: The Lunatic's Guide to the Universe or The Crazed Child's Compendium of Science. His observation is a long time coming - I almost pushed him over the edge when, in answer to his demanding question about how they'd filmed the zero gravity scene in the film Inception ("How did they do that? How? 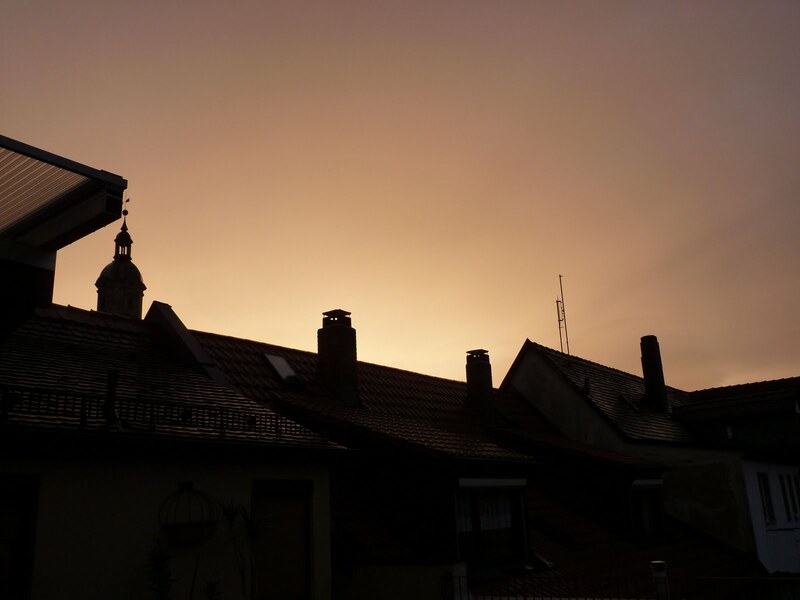 "), I naively suggested that they might just have pumped the gravity out. A look of horror crossed his visage, swiftly followed by pity, then he turned away to laugh into his coffee cup. I thought it was a jolly good theory myself. Anyway, as I always tell him, it's a good job I'm pretty. And then I whip out a copy of Goethe's Collected Works and seek revenge by trying to lure him into a conversation about Sturm und Drang to defend my honour. 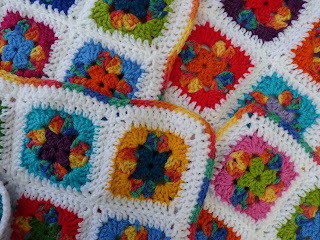 This pattern can be downloaded as a PDF here. This pattern is in American English terms, the British terms are in [brackets]. I've used a DK weight yarn. 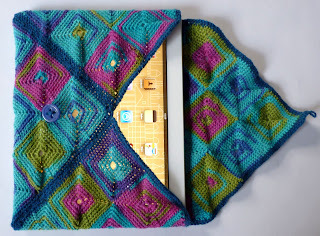 This is lighter than a worsted weight yarn, so I created my corners by crocheting two DC [TR] + two chains + two DC [TR] into the corner space. 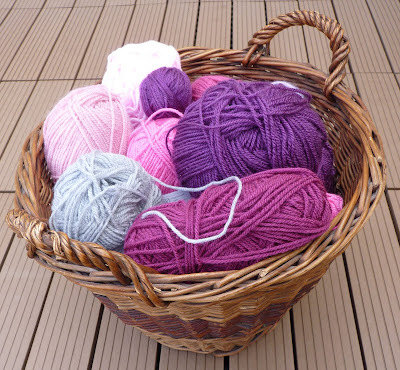 If you find that your work is bunching or curling, it is possibly because your yarn is heavier or your tension is tighter. One way you can correct this is by only crocheting one DC [TR] into your corner spaces, i.e. one DC [TR] + two chains + one DC [TR] into the corner space. 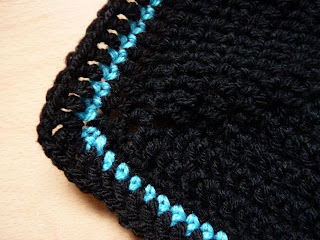 Start by chaining 4, then join with a slip stitch. Chain 1, do 1 DC [TR] in the same stitch below. Crochet 1 DC [TR] in next two stitches, *in corner space crochet 2 DC [TR] + 2 ch + 2 DC [TR], then crochet 1 DC [TR] in the next three stitches. ** Repeat from * to ** twice more. Join with slip stitch to the top of the first DC [TR]. Chain 1, do 1 DC [TR] in the same stitch below. 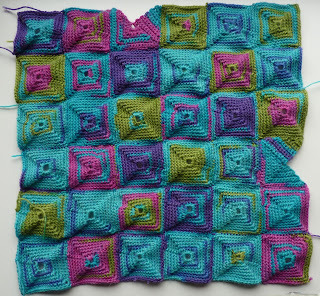 Crochet 1 DC [TR] in next four stitches, *in corner space crochet 2 DC [TR] + 2 ch + 2 DC [TR], then crochet 1 DC [TR] in the next seven stitches. ** Repeat from * to ** twice more. 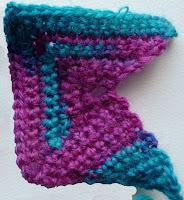 Join with slip stitch to the top of the first DC [TR]. Chain 1, do 1 DC [TR] in the same stitch below. Crochet 1 DC [TR] in next six stitches, *in corner space crochet 2 DC [TR] + 2 ch + 2 DC [TR], then crochet 1 DC [TR] in the next eleven stitches. ** Repeat from * to ** twice more. Join with slip stitch to the top of the first DC [TR]. Chain 1, do 1 DC [TR] in the same stitch below. Crochet 1 DC [TR] in next eight stitches, *in corner space crochet 2 DC [TR] + 2 ch + 2 DC [TR], then crochet 1 DC [TR] in the next fifteen stitches. ** Repeat from * to ** twice more. Join with slip stitch to the top of the first DC [TR]. Chain 1, do 1 DC [TR] in the same stitch below. Crochet 1 DC [TR] in next ten stitches, *in corner space crochet 2 DC [TR] + 2 ch + 2 DC [TR], then crochet 1 DC [TR] in the next nineteen stitches. ** Repeat from * to ** twice more. 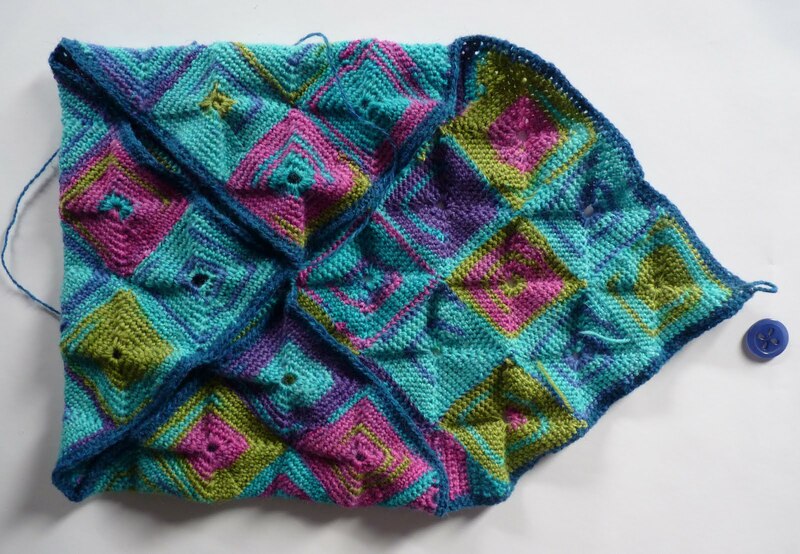 Join with slip stitch to the top of the first DC [TR]. Chain two, yank tightly. Leave a long tail for joining, and cut yarn. This diagram represents how many squares you'll need to do. Brace yourselves, hookers! 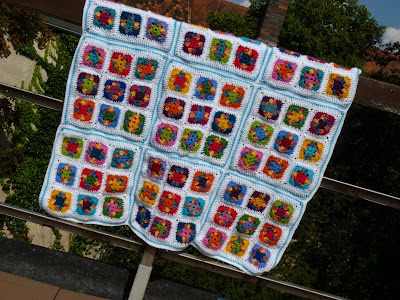 * If you want to make a slightly longer blanket, crochet 18 turquoise squares (two rows of nine blocks), not 9! Lay your squares out as per the diagram above and sew them together. 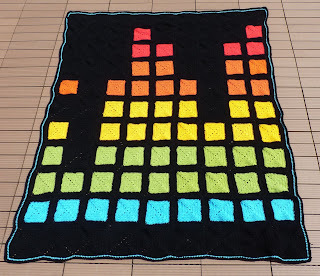 I edged the blanket with a round of DC [TR] in black, then a round of SC [DC] in a contrasting colour (I used turquoise) and finished it off with another round of DC [TR] in black. In an attempt to use up scraps, I once again found myself in the Catch-22 situation of starting a project to use up yarn and then needing to buy more to finish it. That was the first of several reasons why this project began as a good idea and then drove me nuts. 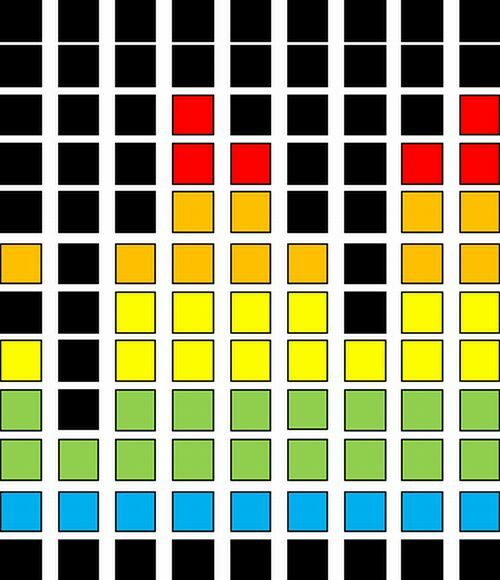 You see, I thought a fine use of blocks of colour would be to recreate a volume equalizer. 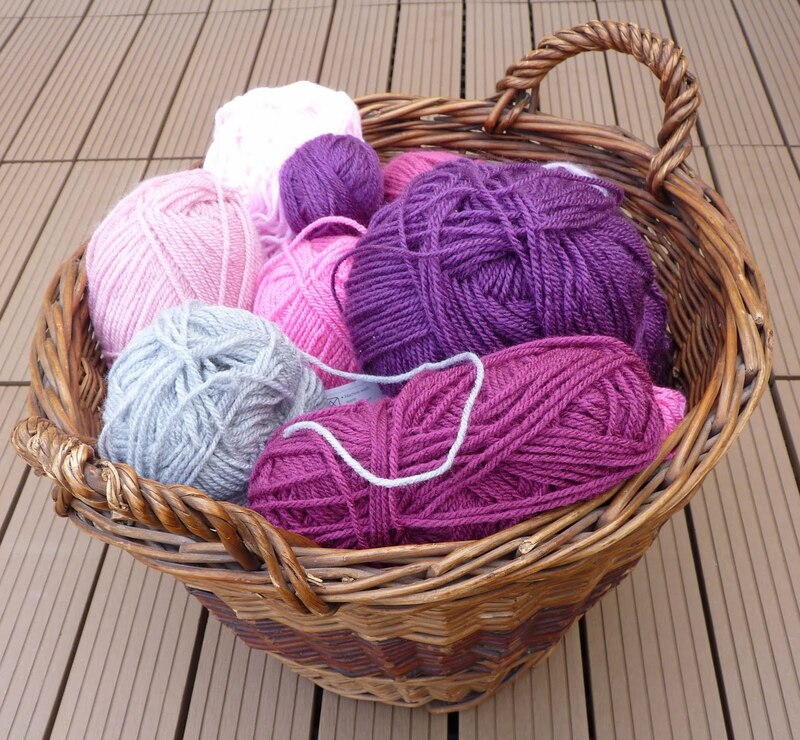 Lots of strong, bright colours combined with black - why, I had a basket full of this kind of yarn, left over from my Réalta. It was given the go-ahead ("Yeah, it's ... cool." Thanks, dudes) by the Gingerbread Bros, who were visiting at the time, and off I went, merrily crocheting squares of colour. 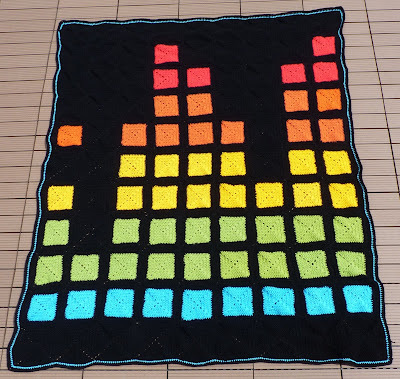 In fact, I had sewn them all together and was feeling very proud of myself, when my husband pointed out that I had made a huge, obvious boo-boo: my colour bars went from red to blue, instead of the other way around. 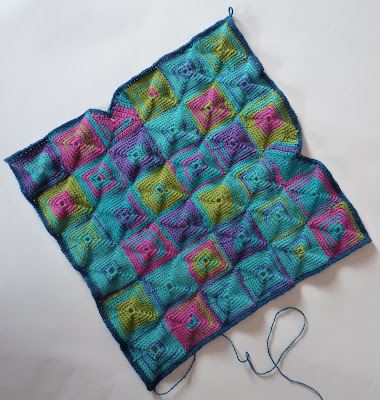 (Click the link above and you will see that practically every picture shows the squares in the opposite colour direction to mine - and yet I managed to blithely ignore the fact that I was doing it wrong. Yay, me.) There was some fist-biting, I admit, and even a measure of teeth-gnashing - but I unpicked the whole thing and re-sewed it, adding more squares till it was the right way around. I know, I know, but I have this slightly obsessive tick from my father's side of the family and that's just they way it is. There's no such thing as an ugly baby, people say. I disagree. Voilà. I suspect they have some vulture blood. These look like very mean little pigeons. So we unpacked our evening picnic and opened a bottle of wine, trying to be all posh and Continental (Mr Gingerbread doesn't even have to try - he is Continental! I, on the other hand, showed my less posh Islander roots by producing a screw-top bottle of our local plonk. I do try, though.) The pigeons were not impressed. In fact, there was a lot of feather-ruffling and shifting from one claw to the other as they tried to make their feelings clear about our invasion of their personal space. "They're very nervous," observed my husband - who is quite entranced by our little trespassers, I might add. The big eejit. 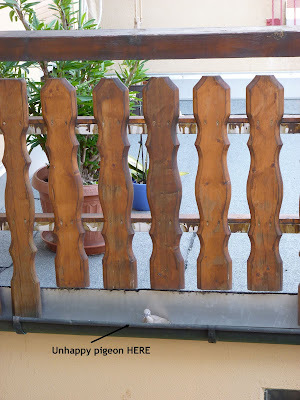 "But it's our balcony!" I shrieked, with wine-induced feistiness. 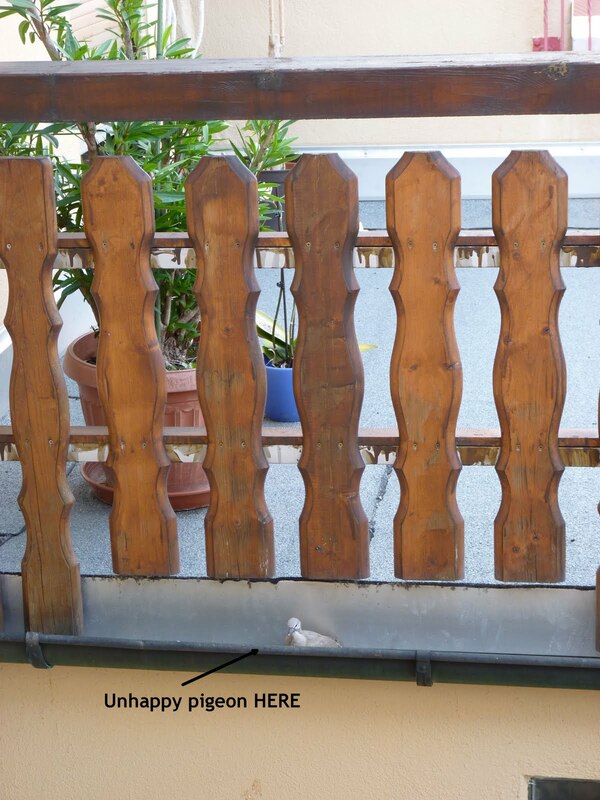 Perhaps sensing the hysteria, the pigeon on the right suddenly took to flight - and slammed into the wall. Mr Gingerbread hopped up and tried to (cough) help the pigeon by cornering it. ("It doesn't want to be touched!" 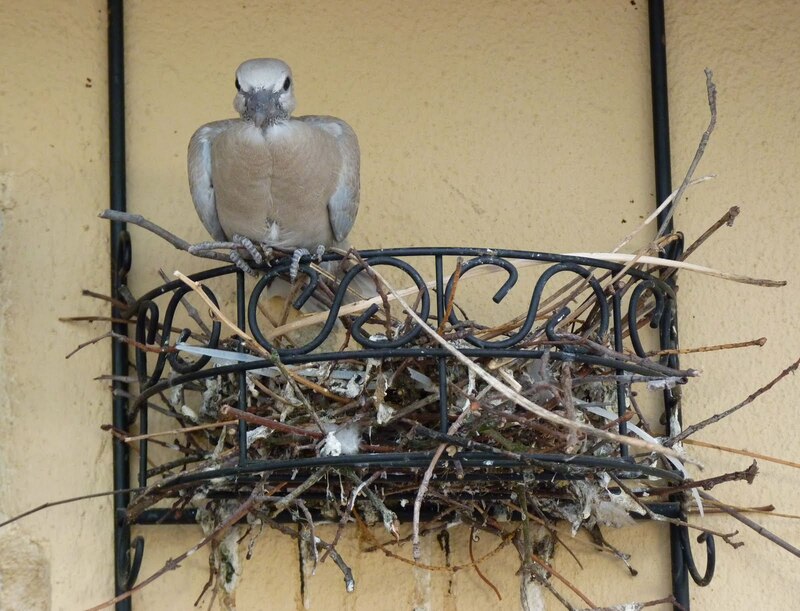 "I'm just going to put it back in the nest!" "It'll have a heart attack and die of fright. Leave it alone." Mr. Gingerbread: "Trust me! I'm your friend! Just hop on!" Pigeon: "Fup off." Instead of behaving like Long John Silver's parrot, the pigeon took off and flew into the gutter on the other side of the building. And stayed there. While its sibling fixed us with its gimlet eyes, staring at us evilly for half an hour before simply ... flying away. "Be afraid, humans. Be very afraid. I'm going to poo you at every possible turn." So we've been pigeon-watching all day long. The parents returned and hoo-hooed at us for hours on end in a very accusing tone. We tried explaining that we didn't actually do anything, but to no avail. 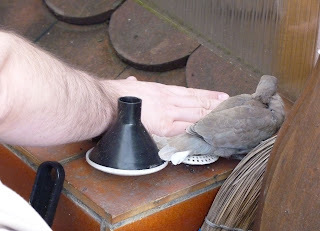 Baby Pigeon flew from the gutter to the bedroom window sill late last night and, as a result, we had to sleep on the bed sofa in the living room in case we scared it. This morning it flew back up on to the patio and later perched on the railings before disappearing - leaving copious amounts of stress-induced pigeon poo in its wake. Mr Gingerbread and I went upstairs this evening to check if it was okay (Mr G.) and make sure the little blighters were finally gone (me), but aside from a splattering of excrement and a flutter of downy feathers, the wingèd vermin had gone. Sadface. Well, well, well. What an exciting day. 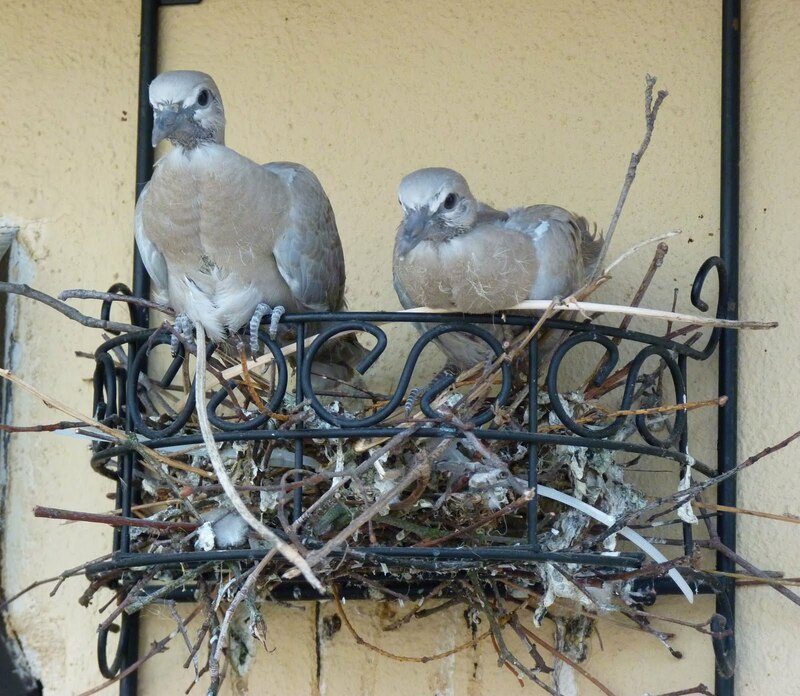 Mother (or Father) Pigeon returned (reluctantly, I suspect) to the nest late last night. As the chicks get bigger, s/he is finding it hard to sit on the nest and has now been relegated to the sidelines, where s/he sits with a claw and a wing awkwardly draped over the pigeonettes in a vain attempt to reassure them that, yes, they have not been abandoned (for now). Those birds will end up in therapy, I guarantee it. the dramatic storm that caused Mr G worry about our little adoptees had another, more serious outcome. When I went into our local yarn store this morning to purchase some sock yarn (not for me, I might add. I was exercising my iron self-control), I discovered the owner in a state of distress: the gutter between the old part of the building and the newer extension over-ran and collapsed in the torrential rain and the yarn store suffered water damage. I clutched my (imaginary) pearls and swooned a little. "Was ... was anything hurt? Did all the yarn survive?" I whispered hoarsely. She looked grim. "I cannot tell a lie," she said, "Some damage was sustained. A few skeins did not make it." We bowed our heads and thought of our fallen comrades. "Where's the sock yarn?" I asked, looking at the empty shelves. "I packed them away," she said. "Not many people knit socks in the summer, it seems." Really? I thought. Is that really so, sock knitters? I would have thought socks were ideal projects for hot summer days, but apparently I was wrong. In any case, a wool shortage crisis was averted when I checked my own stash and discovered that I had two untouched skeins of sock yarn that were more or less what I had gone to the yarn store to buy. Phew (and a small squirm of shame). However, I left the shop owner amongst boxes of wool, with two heaters going at full blast in 30°C (90°F) heat. Fingers crossed her insurance company recognises the gravity of the situation and pays out soon. Just an update: Mr Gingerbread and I have become adoptive parents. 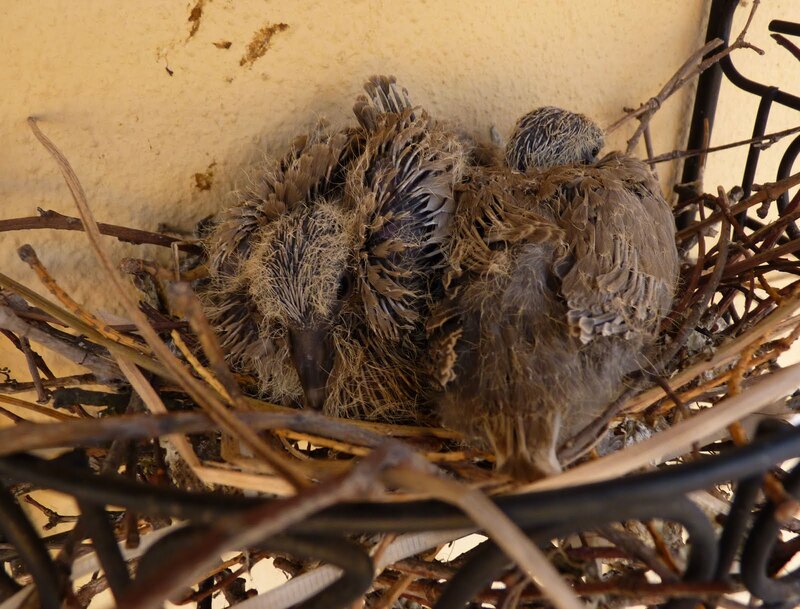 Mammy Pigeon hatched her offspring and promptly abandoned them. 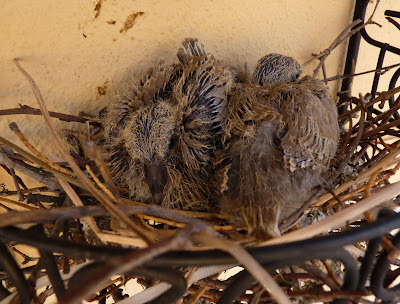 We couldn't get her out of the darned nest when they were just eggs, but now she's off gadding about with her paramours and neither she nor Daddy Pigeon seem to care very much about her two chicks. It might be because they're not very attractive. 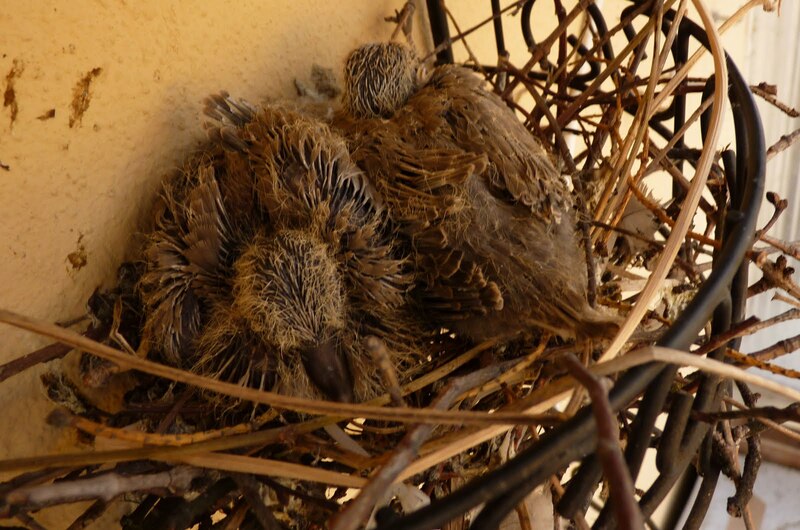 Kittens and puppies, for example, have a certain endearing cuteness to them that makes you want to scoop them up and smoosh them; baby pigeons share a startling resemblance to feathery baby velociraptors. And they poop like a T-Rex: how such small creatures can produce so much poo is beyond me. 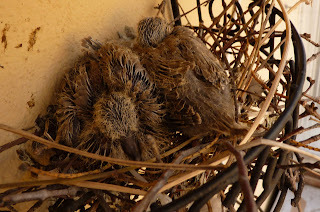 We have their entire environ covered in plastic and as soon as they leave the nest, I'm going to get in there with my scrubbing brush, face mask and rubber gloves. (Mr Gingerbread won't let me evict the Pigeon Family now that they're orphans. He's beginning to empathise with them unduly: today there was a very dramatic summer storm and we went up on to the roof patio to watch Mother Nature batter our neighbourhood. "They must be feeling very frightened," he said sadly, nodding at the nest. I stared at him, agog.) As soon as I can, I'm going to scrub that wall with my industrial-strength disinfectant. Note: this pattern uses American terms, the British terms are in [brackets]. This cozy snugly fits an iPad 2, the dimensions of which are 9.5 inches (24.12 cm) x 7.31 inches (18.57 cm). 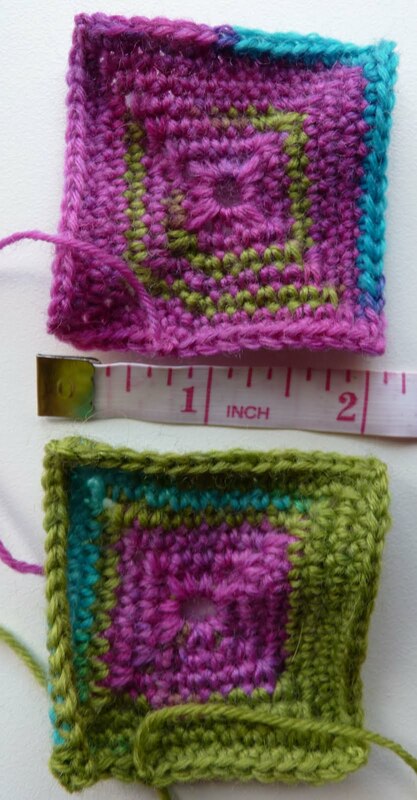 Sock yarn is stretchy and I wanted a snugly-fitting cover, so it's slightly smaller than the device itself. Gauge. Ugh. What an odious way to begin a pattern. Sadly, it's unavoidable at this point, so let's just get through it as quickly as we can. 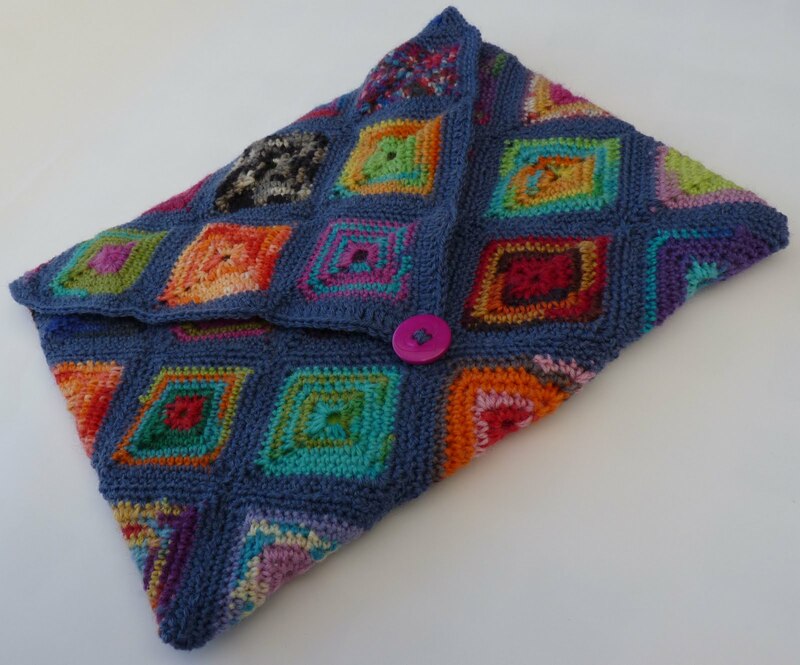 This cozy is basically a 12" (30.5 cm) x 12" (30.5 cm) square, made of smaller squares that are 2 inches (5 cm) in diameter. Each square must be 2 in / 5 cm across: I manage this by doing seven rounds with a 3.50 mm hook. If your square is too small after seven rounds, you may have to use a bigger hook - or stick with the same hook and add another round. If your square is too big, you might have to switch to a smaller hook - or stick with the same hook and do one round less. The main thing is, you have a 2 in/5 cm square at the end. Okey dokey? Off we go. 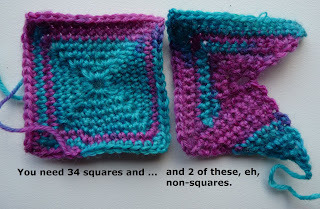 How many squares do I need? 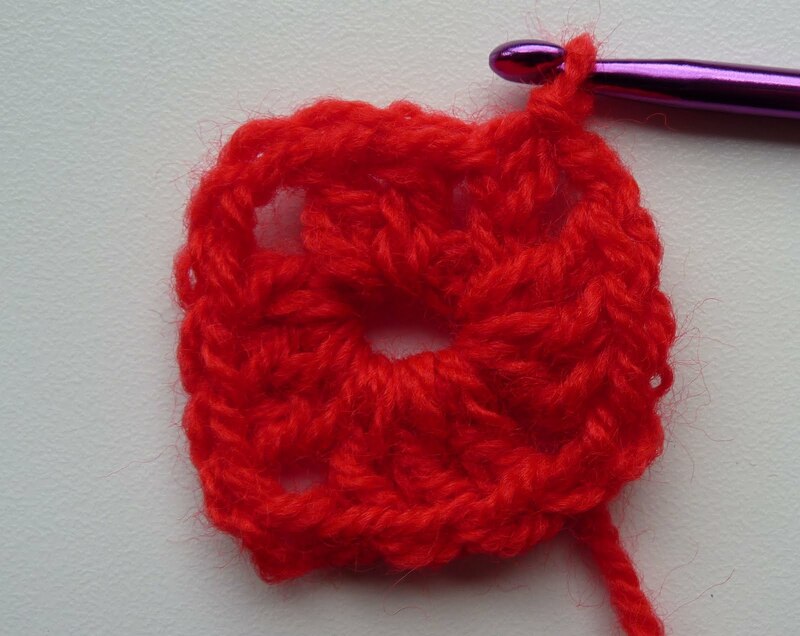 Round 1: Chain two, then do a SC [DC] in the same stitch below (this counts as your first SC [DC] here and throughout), then do 3 SC (DC) into the circle made by the first chain. *Chain 2 (to form a corner), 3 SC [DC] in the circle*. Repeat from * to ** twice more. 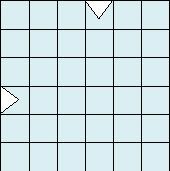 You now have a very tiny square, made up of three SC [DC] on each side and two chains in each corner. Join with a slip stitch to the top of the first SC [DC], but be careful not to join in the top of the starting chain. Repeat from * to ** twice more. Crochet 1 SC [DC] + 2 chain + 1 SC [DC] in the corner chains of the previous row. 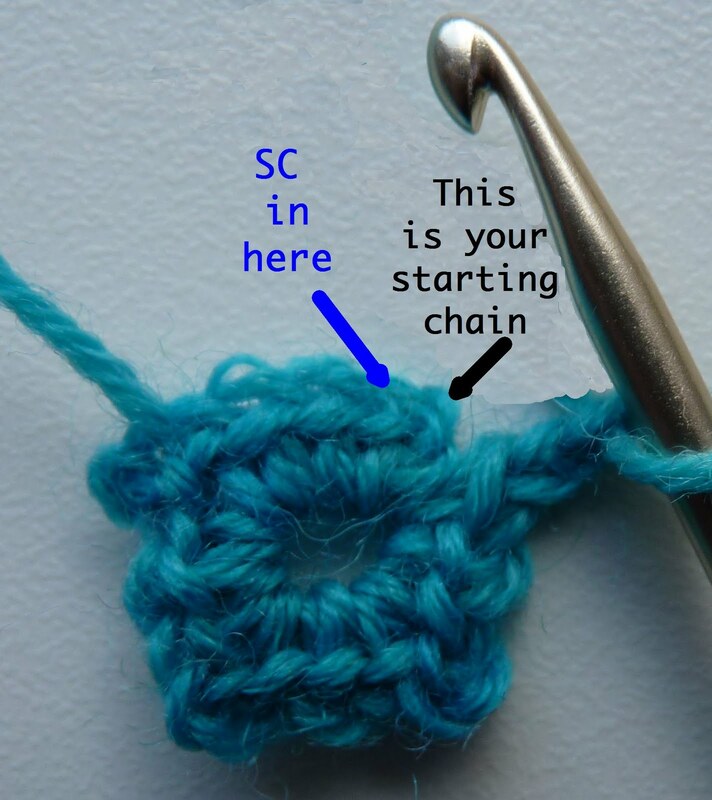 Join with a slip stitch to the top of the first SC [DC], but be careful not to join in the top of the starting chain. Note: your square should now have 5 SC [DC] on each side between the 2 chain that form the corner. This is basically a triangle, with another triangle added on to look like a square with a bite taken out of it. 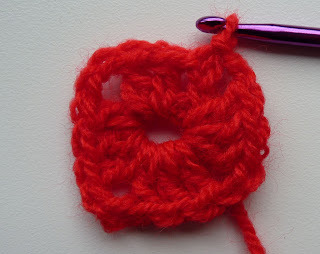 Round 1: Chain two, then do a SC [DC] in the same stitch below (this counts as your first SC [DC] here and throughout), then do 3 SC (DC) into this circle made by the first chain. Chain 2 (to form a corner), 3 SC [DC] in the circle. Turn. Round 2: Chain one, then do 2 SC [DC] in the same stitch below. Crochet 1 SC [DC] in next two stitches. *Crochet 1 SC [DC] + 2 chain + 1 SC [DC] in the corner chains of the previous row. Crochet 1 SC [DC] in next two stitches and then do 2 SC [DC] in the final stitch. Turn. Round 3: Chain one, 2 SC [DC] in the same stitch below. Crochet 1 SC [DC] in next four stitches. *Crochet 1 SC [DC] + 2 chain + 1 SC [DC] in the corner chains of the previous row. Crochet 1 SC [DC] in next four stitches and then do 2 SC [DC] in the final stitch. Turn. Round 4: Chain one, 2 SC [DC] in the same stitch below. Crochet 1 SC [DC] in next six stitches. *Crochet 1 SC [DC] + 2 chain + 1 SC [DC] in the corner chains of the previous row. Crochet 1 SC [DC] in next six stitches and then do 2 SC [DC] in the final stitch. Turn. Round 5: Chain one, 2 SC [DC] in the same stitch below. Crochet 1 SC [DC] in next eight stitches. *Crochet 1 SC [DC] + 2 chain + 1 SC [DC] in the corner chains of the previous row. 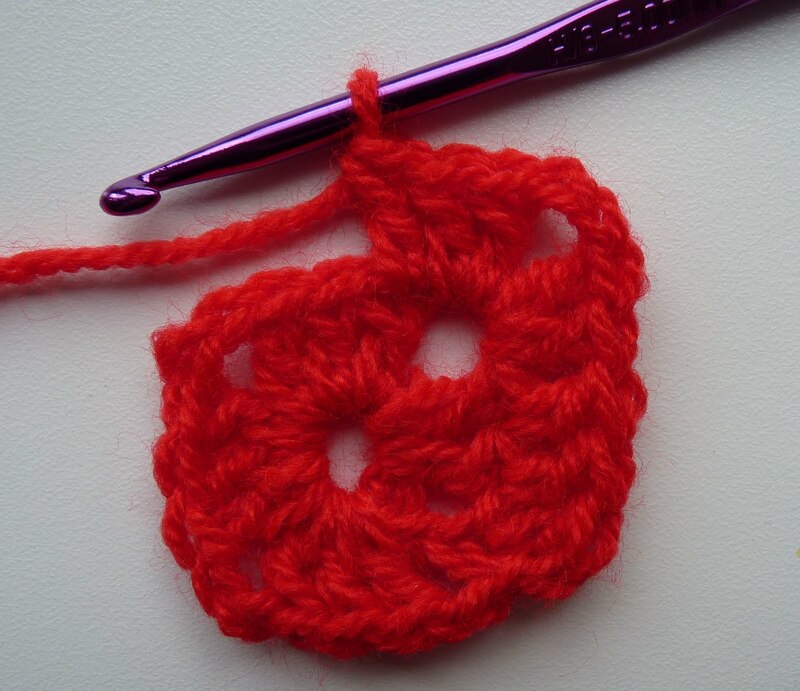 Crochet 1 SC [DC] in next eight stitches and then do 2 SC [DC] in the final stitch. Turn. Round 6: Chain one, 2 SC [DC] in the same stitch below. Crochet 1 SC [DC] in next ten stitches. Crochet 1 SC [DC] + 2 chain + 1 SC [DC] in the corner chains of the previous row. Crochet 1 SC [DC] in next ten stitches and then do 2 SC [DC] in the final stitch. Turn. Round 7: Chain one, 2 SC [DC] in the same stitch below. Crochet 1 SC [DC] in next twelve stitches. *Crochet 1 SC [DC] + 2 chain + 1 SC [DC] in the corner chains of the previous row. 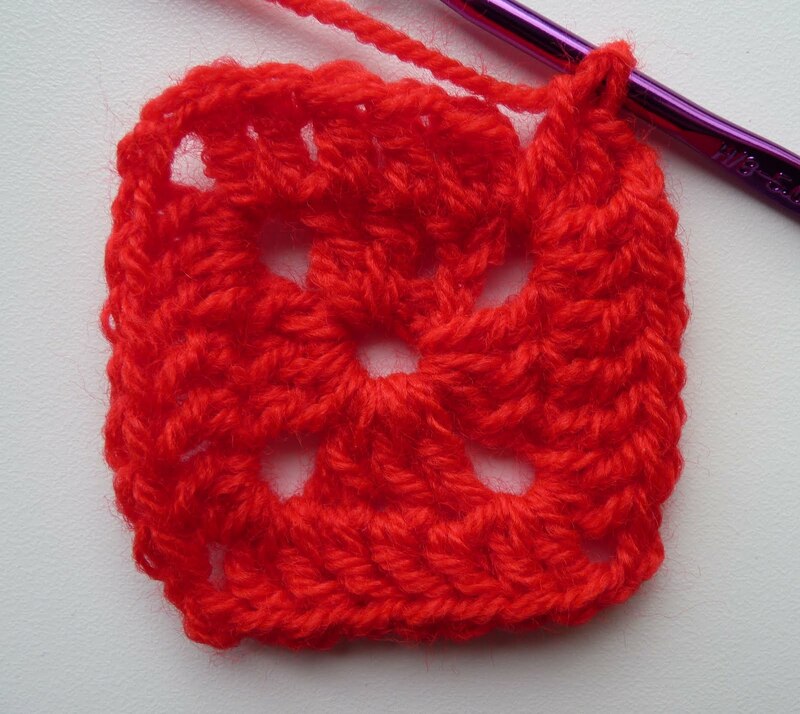 Crochet 1 SC [DC] in next twelve stitches and then do 2 SC [DC] in the final stitch. Turn. 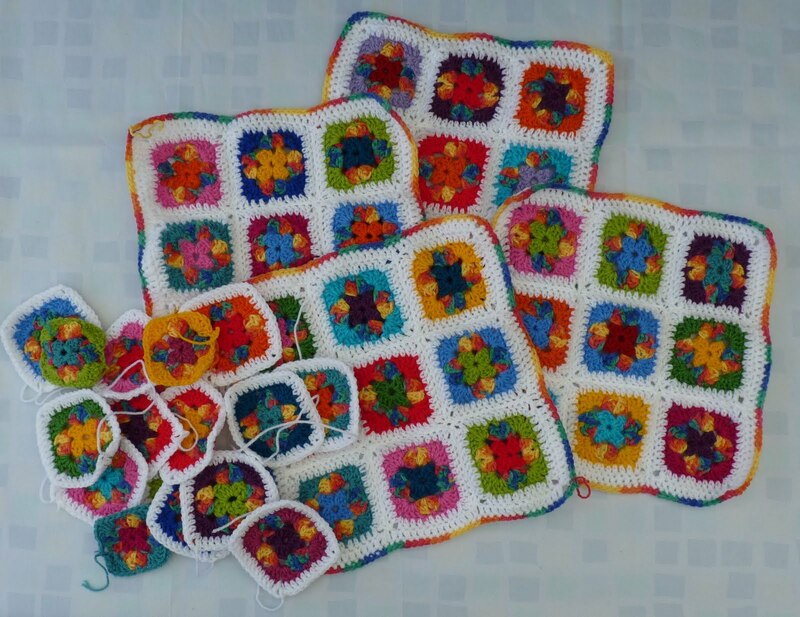 Crochet 11 SC [DC]. Turn. Crochet 1 SC [DC] in next 9 stitches, crochet 2 SCtog [DCtog] in final two stitches. Turn. Crochet 2 SCtog [DCtog] in first two stitches, crochet 1 SC [DC] in next 7 stitches. Turn. Crochet 1 SC [DC] in next 5 stitches, crochet 2 SCtog [DCtog] in final two stitches. Turn. Crochet 2 SCtog [DCtog] in first two stitches, crochet 1 SC [DC] in next 3 stitches. Turn. Crochet 1 SC [DC], crochet 2 SCtog [DCtog] in final two stitches. Turn. Crochet 2 SCtog [DCtog] in final two stitches. Turn. 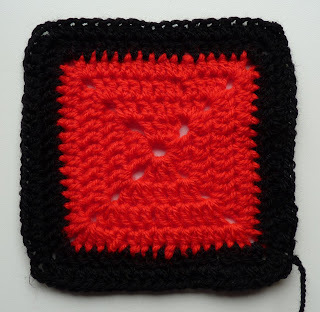 Crochet 1 SC [DC] in last stitch. Chain 1, leave a long tail of yarn to sew together. Do one round of SC [DC] around the sewn square, then a second round of SC [DC], creating a little loop of chains at the tip that's big enough for your chosen button to pass through. Cut yarn and weave in end. 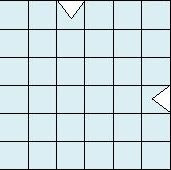 Fold the square into an envelope-shape. Sew the flaps together and add the button. and it prepares a perfect PDF, ready for print!